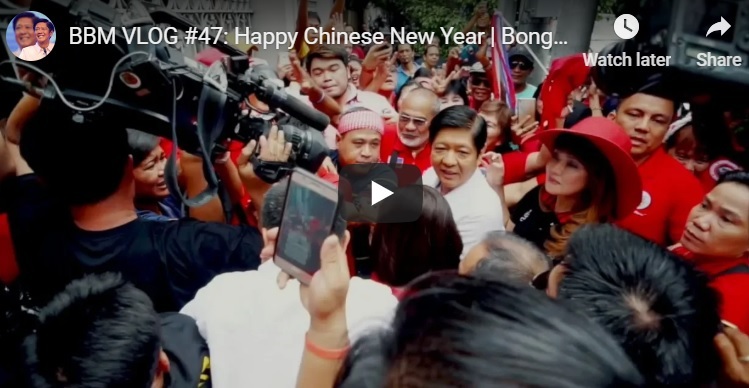 In time for the holy week, Bongbong Marcos urges the public to be patient. He explains that the Supreme Court has to go through many processes to be able to reach a fair verdict in his electoral protest against Leni Robredo. He, however, alerts voters to be vigilant on possible election anomalies during the midterm elections following the negative reports from various overseas Filipinos. His sister, Imee Marcos runs for Senator who is leading in the Hong Kong poll. Marcos expresses his regret of not being able to announce the update of the protest point blank. This is due to the gag order of the Supreme Court. What is evident is his confidence to get a favorable result and his trust that he can get justice after all the sacrifices. The hopeful son of a great leader former President Ferdinand Marcos confirms once again that the recount in the 3 pilot provinces is due for completion if it is not yet the case. He knows that his evidences are substantial. This is why he appeals for the technical examination of the ballots in the ARMM region. The Comelec itself finds that 80% of the voters there are fake. The namesake of the Marcos patriarch finds announcing the list of drug-related politicians proper in warning the people. Nevertheless, he also suggests caution in doing this especially during elections. He said that it can be used by corrupt officials in power to discredit or intimidate their opponents. There is a big reason for Marcos’ strong confidence to winning the electoral protest. Circumstances favor him over the LP opponents. They are doing everything they can to prevent him from coming back. Even Kris Aquino has to defend her brother despite their current rift. It seems that Mar Roxas, another senatorial candidate is abandoning the LP ship. His manager blames his defeat to the former President Noynoy Aquino’s depicting him as a side-kick just like Batman and Robin. The conflict between ex-Pnoy and Kris is about her 2018 social media post. She laments about “why it was so clear” to her that President Rodrigo Du30 won in the 2016 elections. Roxas came second to him. Kris also remains civil with Marcos. She interviewed him once and they even have mutual friends. They are both godparents of a friend’s child. Will it be another clear win for Bongbong Marcos? It must be for SC to take this long. The decision should not be questionable. Therefore, Filipinos especially the Marcos loyalists must be patient. [VIDEO]: Si dating Biliran Rep. Glenn Chong ang haharap sa matinding job interview kasama si News5 Chief Luchi Cruz-Valdes. Karapat-dapat kaya siya para sa iyong boto? Chong points out 459 precincts already transmit their results that generate at least 220,000 votes before the election which are substantial enough for Robredo’s win. In the future, he recommends that if there’s a hybrid system with manual voting and counting, the physical counts are already in the precincts’ record. These can then be the basis for the digital transmissions should there be suspicious trends like in Robredo’s case. 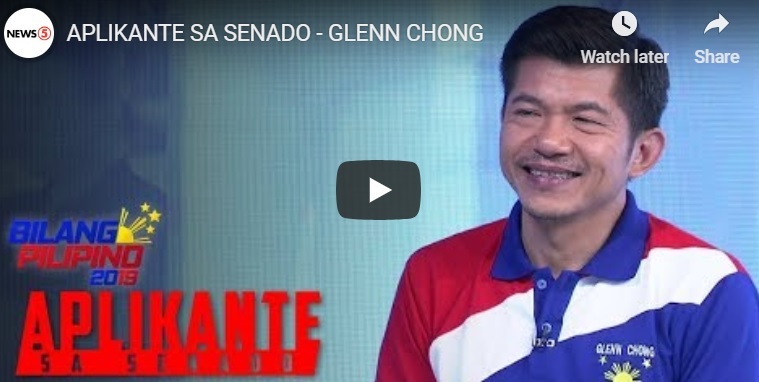 Chong confirms bluntly that he needs to be a Senator to be able to defeat the cheaters during elections. He would have his own legal forums and authority to defend his stand on clean election systems. As a private person, the mechanisms are limited to flourish his idealism to protect the people’s votes. He swears to realize this promise when elected. 150 million is hilarious to be paid by a syndicate just to break Glenn Chong’s spirit according to the interviewer. She made it sound bizarre that someone actually would pay that to discourage a guy like Chong. He answers with the utmost composure saying that he’s noisy. Perhaps a pain in the neck for the election manipulators. Chong believes that Richard Santillan’s case was meant to scare him in pursuing his advocacy. The anti-poverty projects of Glenn Chong follow the 3 foundations of health, education, and transportation. Poverty incidence in Biliran in 2007 was 65% but immediately drops to 30% after Chong left in just 3 years. He addresses the anchor’s question with legitimate data that cannot be contested. 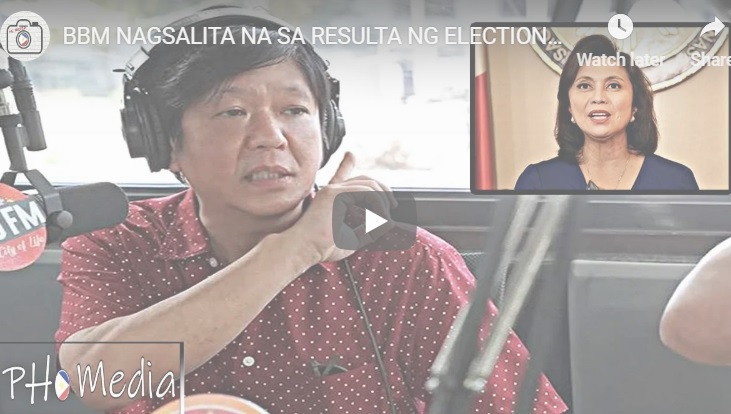 Chong did not intend to protect Bongbong Marcos for his electoral protest fight but his concrete findings on Smartmatic’s anomalies put a lot of weight on Marcos’ case. Besides, he has a very effective online and offline systems that encourage common people to take part in his campaigns. Filipinos definitely need a Senator like him. 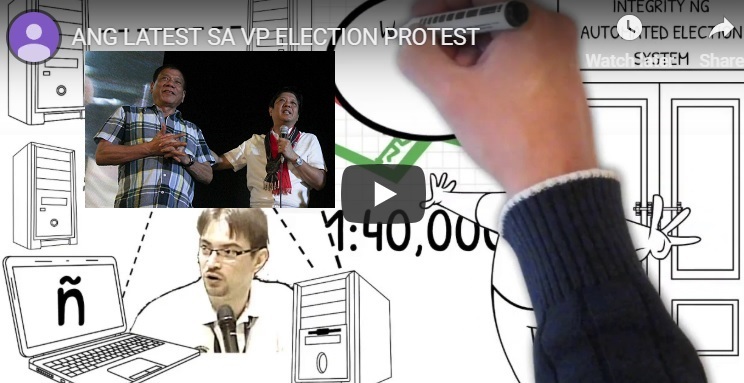 [VIDEO]: A RECAP ON THE VP ELECTION PROTEST. It is quite noticeable via social media that issues are raised to divide supporters of Marcos and Du30. Many posts imply that the President could have a hand to speed up the resolution of the VP electoral Protest that is now on its third year against the presumptive Vice President, Leni Robredo. However, if one observes the Filipino leader’s actions, it is a sure thing that he is doing everything in his power to set the record straight for Marcos but following the rule of law. Often, Du30 thinks out loud but these signify his true feelings and intentions. People can only realize his achievements when they finally happen. Meanwhile, Marcos, in his extremely urgent motion of grave concern with omnibus motion, wants PET to order the Voters Identification Division of the Commission on Elections–Election Records and Statistics Department (Comelec ERSD). This is to produce the documents involving its technical examination on the Voters Registration Records (VRRs) as against Election Day Computerized Voter’s List (EDCVL) of 508 established precincts in the provinces of Lanao del Sur, Maguindanao, and Basilan. Robredo consistently opposes such forms of technical examinations of the ballots and insists for SC to use the allegedly tampered digital images. President spokesperson, Salvador Panelo said that President Du30 does not resent Spain’s 333-year colonial rule. He merely asserts the Filipinos’ national identity. “He said that Maharlika is a Malay word. Since we are Malays, we should have a name identified with us. I agree with him, I like the idea of Maharlika as a name for the Philippines,” Panelo clarified. There are two contradicting views about the supposed proposal to change the country’s name. “One, as one of my staff lawyers pointed out, the ‘Philippines’ is mentioned in the Constitution. So if you issued an executive order or passed legislation to rename it, some constitutional expert might say, ‘You cannot amend that, it’s in the Constitution’,” Panelo said. The other argument, according to the President’s spokesperson, is an instance where the name ‘Philippines’ was just established for the time being. The Constitution provides that Congress may enact a law that can change the name of the country. It needs to submit it to the people for a referendum,” Panelo said. He stresses that a mere executive order would not be effective. President Du3o certainly appears to endorse Ferdinand Marcos’ namesake. Ferdinand Marcos Jr., better known as Bongbong Marcos. He refers to him as his Vice President. It may be a lengthy process for Marcos to regain his position as the country’s second leader but Du30 potentially paves the way for his succession to the top job when he steps down before his term or in 2022 during the next Presidential elections. [VIDEO]: They say that in the Year of the Pig, fortune favors those who are patient. So for those who have been waiting patiently for news about my election protest, this update is dedicated to you. 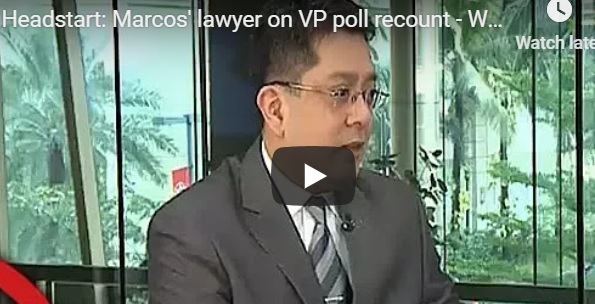 Marcos came up with 8,000 witnesses against the said election frauds but the PET deferred the first cause of action to give way for the recount. Now, the recount of the first 3 pilot provinces namely; Negros Occidental, Camarines Sur, and Iloilo that show many anomalies are about to be completed. The ballots are about to be decided by the justices if they are perfect reproductions of the original. The Comelec can’t even explain it and promises to ask Smartmatic about it that amused the audience during a Senate hearing. It is definitely not a game over case yet. The electoral protest status is contrary to Leni Robredo’s lawyer, Romulo Macalintal’s announcement. He might only be desperate of media mileage for his Senate candidacy. Marcos said that the discussion on the fraudulent acts is not yet undertaken. This is called the appreciation phase. To prove that anomalies did happen during the 2016 elections, the results of the ballot recount in the pilot provinces must convince the PET that there was indeed fraud. Only around 200 plus more presincts are left for counting. Both sides have to contest if the questionable ballots must be counted or not right after that. Macalintal always says that the concerns raised by Marcos are but normal occurences. However, Atty. Vic Rodriguez insists that for one thing, the tampered ballots are not anymore a faithful reproduction of the original which is against the law. The former Senator is so dedicated to finalizing his electoral protest against the presumptive VP, Robredo. In fact, he is not running for the next elections because his previous votes in 2016 are not yet counted. The verdict of the said protest can determine if the country still has hope to be able to conduct a clean and honest poll. The 2019 race should be under close watch because Smartmatic is still a player despite its shortcomings. Aside from supporting his sister, Imee Marcos’ Senatorial bid who is on the top 10 favorites, Marcos will frequent Ilocos Norte because his budding nephews are progressing in their political careers. He vows to campaign for them. So, even if his term as VP is set aside, the Marcoses’ reign in the Philippines is very well secured with the young generation.